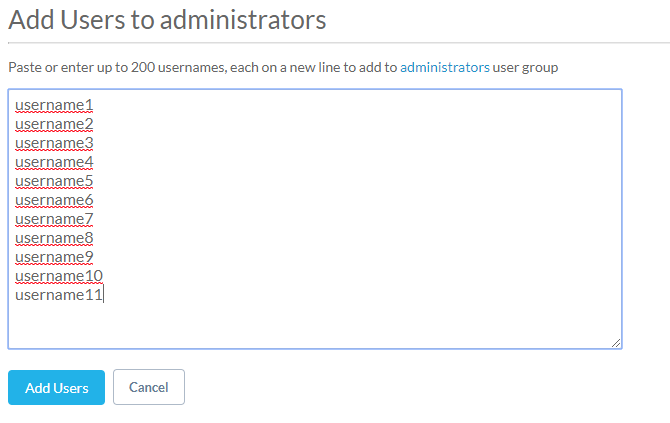 User groups can be created at the point of CSV user upload, if supported by your current user onboarding method. If your app uses Email Self-Registration, or Single Sign On, then you’ll need to use this manual method of creating and managing user groups. To create a user group, start by clicking on the cog icon at the top of the CMS. Then click on ‘User Groups, and then ‘Add New User Group’. 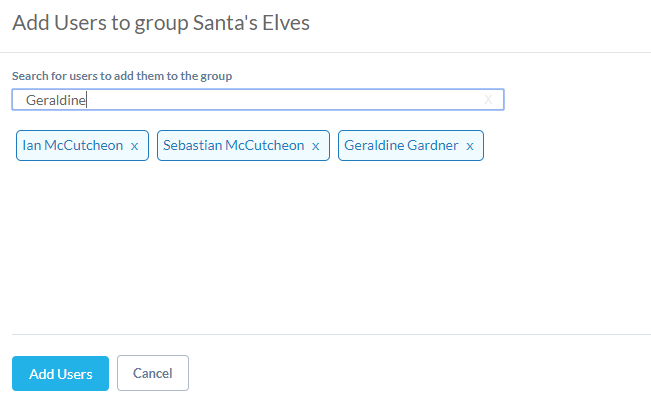 Now choose a name for your user group, then click ‘Save Changes’. 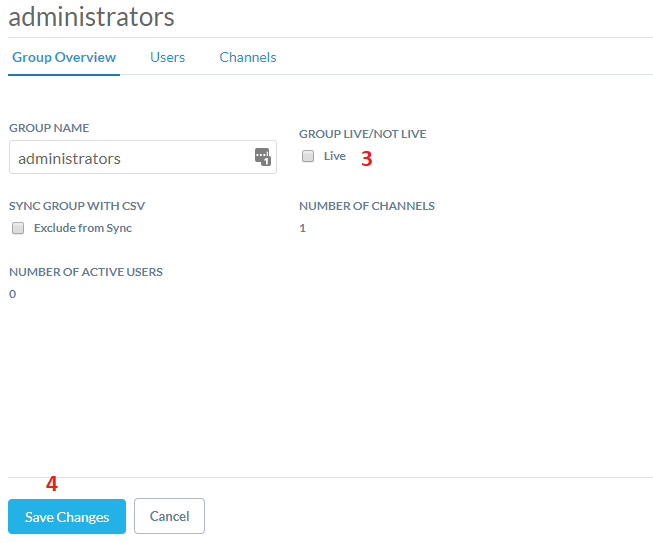 Now you have created your user group, you will still need to add users to your group, and add your group to a channel. To deactivate a user group that you no longer wish to use, start by clicking on the cog icon at the top of the CMS. Then click on ‘User Groups’, and click on the user group that you wish to deactivate. 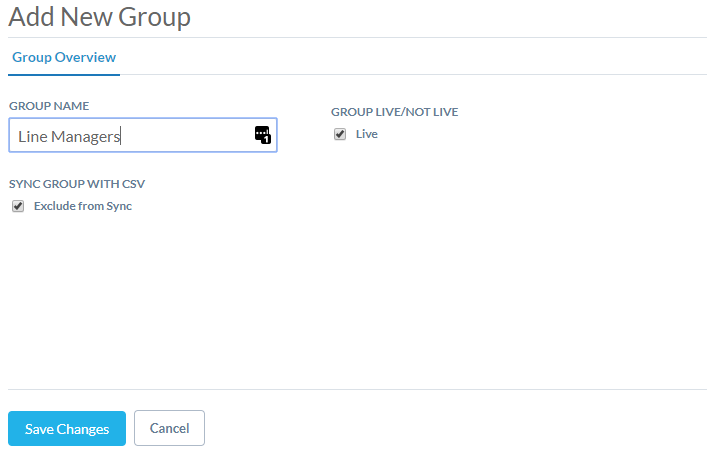 After you save your changes, in the list of user groups you will notice that the group status has changed to ‘not live’. 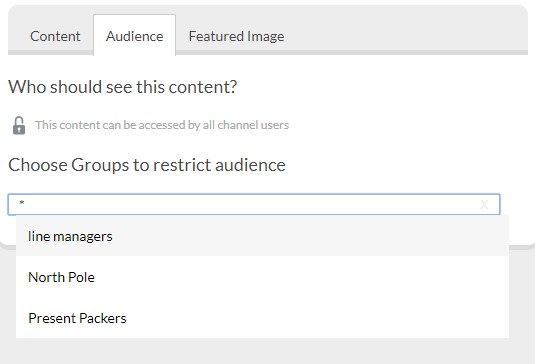 It will no longer be available when choosing which user groups can see your content in the audience tab. 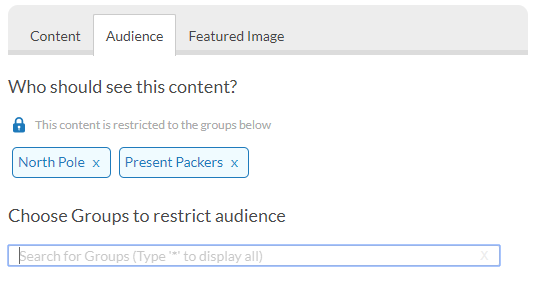 Any live content assigned to that user group will also now be unavailable to those users. Users can be added to groups using the CSV user upload if your app’s onboarding method supports it. If your app uses email self-registration or Single Sign On, you will have to use this manual method of adding users to groups. If you aren’t sure which onboarding method your app supports, please contact support@theappbuilder.com. There are two ways to manually add users to groups. You can add a user to a group using either the ‘User’ screen if you want to search for a single user and add them to a group, or the ‘User Groups’ screen if you want to find the group, then add multiple users to it. If you have an entire of list of users that you want to add to a group however, follow the instructions for Bulk Adding Users to Groups. When you want to view the group, then add users to it, you can do so from the User Groups screen. Click on the cog icon at the top of the CMS, then click on User Groups. Now click on the user group that you want to add users to. Now you can search for users to add to the group. You can search by first name, last name, username or job role. Search for the user then click on them when they appear. You can search for and add multiple users as the same time. When you’re done, click on ‘Add Users’ to add the users to the group. Now you’ll be brought back to the User Group, where you will see the list of users that are currently in the group. To remove any users, simply click the red X beside their name. If you want to re-order the list of users in the group to make it easier to find people, just click on the arrow beside to the field name – this will order the users either ascending or descending alphabetically. Click on the cog icon at the top of the CMS, then on ‘Users’ and search for the user you require. Now click on the user to open the user details screen, and navigate to the User Groups tab. Now click on +Add User Group to select the group that you want to add the user to. On the next screen, simply choose which groups you want to add the user to by clicking on ‘add group’. You can add the user to as many groups as want. When you have added the groups, click Close, and you’ll see the list of the groups that the user is now a member of. To remove the user from any of these groups, simply click the red X next to the group name. You’ll also be able to the see the total number of active users in each group. Before you can add a user group to a channel, make sure you have created your user group. In order to publish content to specific groups of users, you must first add your user groups to your channel(s). This will allow you select a user group when publishing content in that channel. First, click on the cog icon at the top of the CMS, then click on ‘User Groups’. Now click on the channels tab, and finally on + Add New Channel. When you click on +Add New Channel, you will see a list of the channels available from your app library. Simply click ‘Add Channel’ beside any of the channels that you wish to add the group to, then click Close. Now you’ll go back to the User Group screen, and you’ll see that the list of channels available for the group has been updated. Should you wish to remove a user group from a channel, simply click the red X beside its name. If you haven’t completed any of these steps, click on the appropriate link above. Now that you have created your user group, added users to it, and added the group to a channel, you’re ready to segment your content so that it’s only visible to specific groups! Start by creating piece of content as normal on the CMS (a page for example), but before clicking Save and Publish, navigate to the ‘Audience’ tab. This where we will choose which groups of users can see this content. You can see that by default, content is available to all users, unless you specify a group, or groups. Now click on the group that you want that to be able to see the content. If you want to add multiple groups to be able to see this content, you can do by repeating the process. Selected groups will appear in blue, and the padlock icon will shut – showing you that the content will only be available these groups. When you’re satisfied that you have added the group(s) you want, now you can click the Save and Publish button, to publish your content so that it’s only visible to users who are in the specified groups. While you can add users to groups from the ‘user’ screen or from the ‘group’ screen if you are adding single users, if you have a list of all of the users that you want to add to a group, you can do this in bulk. Note that all of the users that you want to add to a group must already be users within your organisation – this process will not create new users, it will simply add existing users in to a user group. Click on the cog icon at the top of the CMS to access your administrator controls. First click on ‘User Groups’ and then on the group that you wish to bulk add users to. Now click on the ‘users’ tab to see a list of users currently added to this group, and click on ‘bulk add users’ at the bottom of the screen. This function does not create new users – it simply adds existing users to user groups. If your list of users is valid, you will be able to click on confirm and complete, and your list of users will be added to the group.